I am linking up over at Home with 4 Kiddos to share new recipes on Tuesdays. It's a great way to add some variety to our dinners during the long winter months! We've been making wings a lot lately because they're easy and the kids like them. This week I am sharing another simple baked wing recipe. In one bowl, beat three eggs. In another bowl, pour two cups flour. Heat three tablespoons of oil or lard in a frying pan. Dip each wing in egg, drench in flour and fry until brown on all sides in the oil or lard. Place browned pieces in a 11x13 casserole dish. Add more oil depending on how much chicken you are frying. Mix together 1 cup white sugar, 4 Tbs soy sauce, 4 Tbs water, and 1 Tsp vinegar. Pour over chicken in casserole dish. Bake one hour at 375. Now I like to run my chicken under the broiler before serving. If you want to do this transfer to a cookie sheet and set the broiler on high. Return chicken to the over for no more than three minutes. Remember that cooking times may vary. Always check the temperature of your chicken before serving. Have a recipe to share? 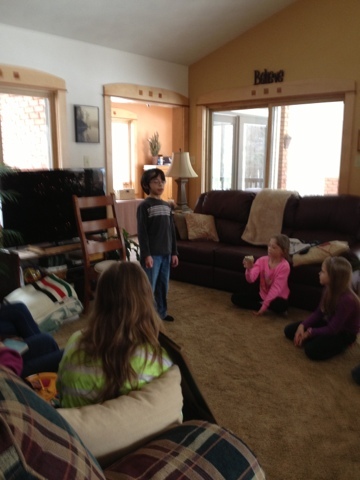 Come and join the fun at Home to 4 Kiddos! Michael had a video made to promote his summer program. You should really check it out, even if the only reason is to see how well he rocks a beard. Michael is rocking a beard video! Okay, so Malcolm is still super sick. In fact he is on his third antibiotic in seven days. I am totally not one of those antibiotic moms and so you can probably guess that I. AM. FREAKING. THE. HECK. OUT. This being Friday morning while your reading this and since I wrote this post earlier maybe I will have a positive and happy update to report. Even though there are five kids running this house, the fact the baby is sick has turned things upsidedown. I find myself saying things like, "Well, if Malcolm is better than..."
I can almost hear the criticism over antibiotic use from all you naysayers. Well, I hope your precious babies never have blue lips from coughing so hard. Yes, his lips were blue and he could not get a big enough breath to cough. This was Wednesday so hopefully there is much improvement by the time you read this. Yeah for antibiotics to give my baby the ability to breathe! Our piano teacher quit without warning yesterday. Please keep her in your prayers as she has some major things going on in her life right now. We had a meeting last night with the board of a local church about using the place for LMCA. Keep your fingers crossed for us on this one. It would be a good fit for us! 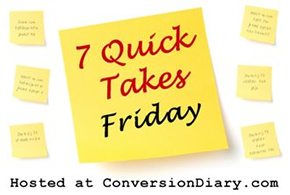 Check out more Quick Takes at Conversion Diary! Since Margaret's illness has wiped out all by the most essential workbook activity for the last week (read: sing ABC, play Kindle (Angry Birds is math, right? ), do review item related activities), I am leaving you with the option of heading over to read about Clan Donaldson's Lent adventure. Seriously folks, the lists she creates for her kids could be a universal Lent list for kids. Even my non-Catholic readers will get a good chuckle out of this. The "Sacrifice Menu" for Kids. 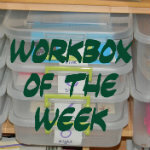 And look for Workbox of the Week to return next week! I am linking up over a Home to 4 Kiddos to share new recipes on Tuesdays. I love to try new things in the kitchen and this blog hop is an easy way to view lots of new ideas! This week I am sharing a super easy Baked BBQ Chicken Wing recipe. I often make this to bring to potlucks. Although it does require a little planning, it doesn't require that much work in the kitchen. To get started, place 4 pounds of chicken wings in a deep dish. Grab a bottle of your favorite BBQ sauce (or make your own), and pour all but 1/2 cup of the sauce over the chicken. You will need 1/2 cup of sauce to brush on while baking. Cover chilcken with plastic wrap and refridgerate for eight hours or overnight. Heat your oven to 375. Line a cookie sheet with aluminum foil. Coat aluminum foil with no-stick spray. Place chikcen in one layer on cookie sheet. Discard sauce in dish. Using your reserved sauce, lightly brush each piece of chicken with sauce. Bake for one hour, brushing with sauce every 15 to 20 minutes. Remove from oven and turn broiler to high. Return chicken to oven under broiler for three minutes. Transfer chicken to a serving dish and your ready to go. Cooking times may vary. Be sure that your chicken has reached safe temperatures before serving. Have a recipe to share? Come and join the fun over at Home with 4 Kiddos! Over the last several years, Michael and I have been slowly making the shift to a more "classically focused" education for our boys. Classical Academic Press was one of the companies that we discovered that carried solid curriculum with a strong classical focus. What originally drew me to the company were the actual books used in their programs. So many times I would come across books that were dry, colorless, and dull to teach and learn from. Classical Academic Press adds life to teaching basic subjects such as Latin, poetry, and Logic. Their books are engaging, creative, and fun to look at. All of these factors are important when you are teaching a reluctant learner. Which brings me to my newest exposure to Classical Academic Press; their Song School Spanish program. 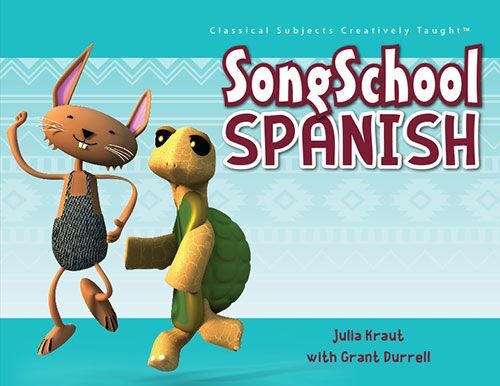 Many folks I know are familiar with Song School Latin, but few know that the same interactive approach has been created for young learners for Spanish. 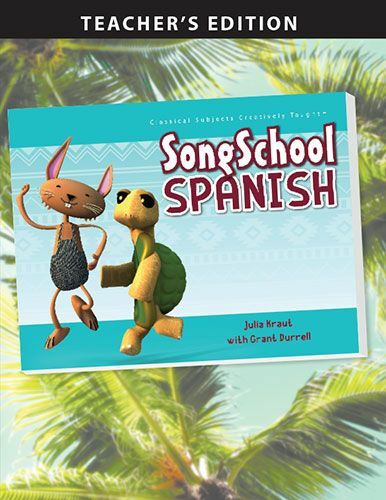 Song School Spanish is an easy and effective curriculum for parents to expose young learners to a foreign language. This program, intended for children from Kindergarten to Grade 3, is filled with songs, lessons and activities that offer an introduction to vocabulary, simple phrases, and even some basic grammar. The Teacher's Edition offers answers to the worktext, as well as additional activities for each of the chapters. It was pretty easy to incorporate this program into our already existing curriculum, which made me wonder why we haven't been doing a modern language study since the beginning. The CD was listened to in the car on the way to classes, co-op, and even snow tubing. We also had it in our kitchen player to rotate with our other musical selections. In addition to listening to the CD, we "completed" activities in the student book at least once a week. Now I say "completed" because as true homeschoolers we tweaked the program to make it fit better with our needs. How we did this is by jumping around in the worktext to whatever interested Henry. We started at the beginning, but I could tell early on that I wasn't going to keep his focus. Since he is on the older end of the age recommendations, and he is a quick learner, I let him decide which chapters to study. I would skim the book and say, "Would you like to learn about manners, animals, colors, etc." and let him choose. This didn't always work the way I intended it to go, but for the most part I was pleased with his exposure to early Spanish skills. One thing I would say is that the CD is easily adaptable to younger and older children. Margaret, age 4, was able to pick up on the catchy tunes, and although James, grade 5/6, may not have interested in the music, he listened to it as well and perhaps even improved his pronunciation because of it. I was hoping to ad a video here, but I swear my new computer hates me. Check back at a later time when I figure out how to get the video onto the blog! "Hey Henry, what do you think of the Spanish program we've been doing for the review program." "Try to use Spanish in your response." "I can't say everything I want to say in Spanish!" "Just say what you can." "Muy Bweun. Ummm. Amigo. Por Faver." "Did you like the program?" Song School Spanish is available on the Classical Academic Press website for $24.95. The teacher edition is also $24.95. In addition to this Spanish program, Classical Academic Press offers many other programs for homeschooling families. The Song School Latin program I mentioned above, as well as programs in Greek, French, Logic, Bible, and Poetry. Visit the Classical Academic Press website to view their full line of products. 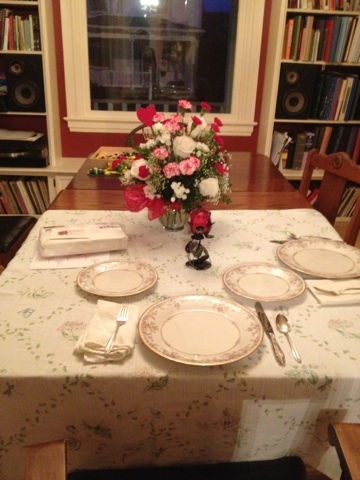 Gotta love the Lego set behind the flowers. I have had a lot of littles go though this place. You'd think by now that I would have things figured out. And I think I probably do. But each kid is different and what works for Child One may not be the answer to bringing peace to the house with Child Four. Not only that, but after five kids some routines and practices just get old. Sometimes adding an extra activity or a fun project can really improve the dynamic of the whole family. 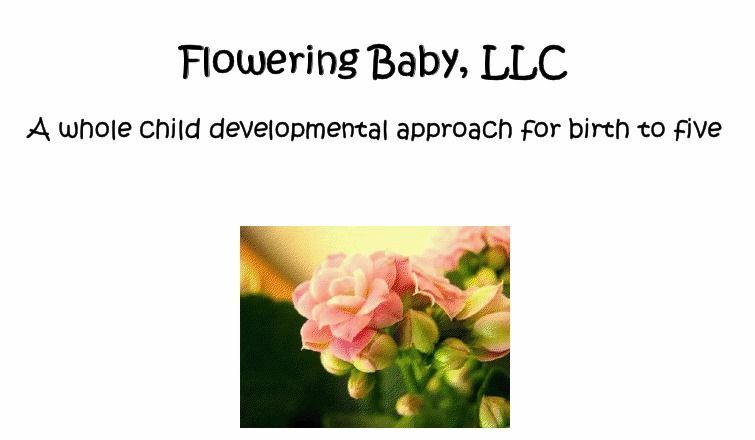 Flowering Baby, LLC is a program designed for children from birth to five. Part curriculum development and part lifestyle adventure, I found that Flowering Baby, LLC not only offered suggestions for activities with my littles ones, it also helped reshape the way I approach this precious age group. Although the program offers materials for birth to five, I used it primarily with Margaret. Lately I have felt really out of sorts with the whole Pre-K/K education she is receiving. 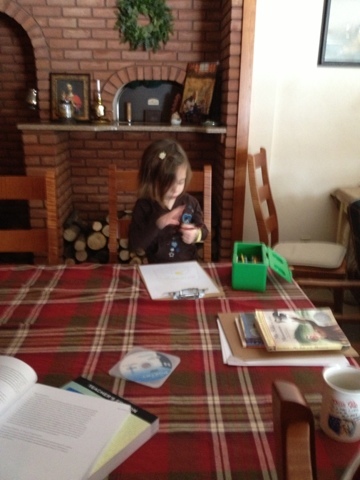 She has her workboxes, but between dealing with Manic Malcolm and homeschooling three other grade levels, Margaret gets left out of the homeschooling day a lot. We have been faithful with the workbox system, but even the routine of that was beginning to feel like a chore. Plus, this is my fourth time with this age group in five years! Motivation was not happening for me. Upon receiving Vol. 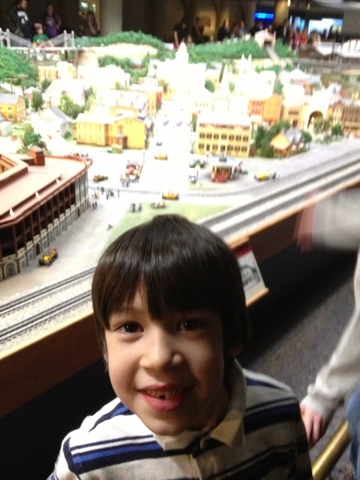 5: Four to Five Years, I began to get inspired again about this age level. The two parts to this part of the program map out a daily schedule of basic skill learning (letters, numbers, movement, songs, etc.) 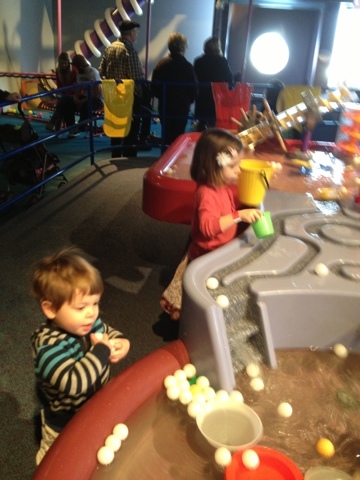 as well as thematic learning (animals, holidays, space, etc.). 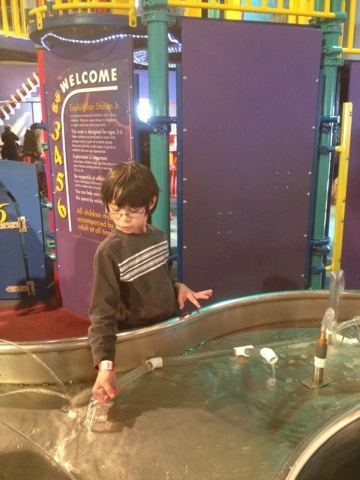 Used simultaneously, this program offers more learning than any of my other three kids had at this age. Not did Margaret learn new skills and facts, her interest was aroused about the world beyond this house. So much of her life is centered around our family and community. The theme units allowed her to begin to develop interests in things on a much larger scale: "Is there a song about why stars sparkle so much?" "Did you know it looks the same outside when it is cloudy and cold and cloudy and not so cold?" HOW WE USED THIS PROGRAM? 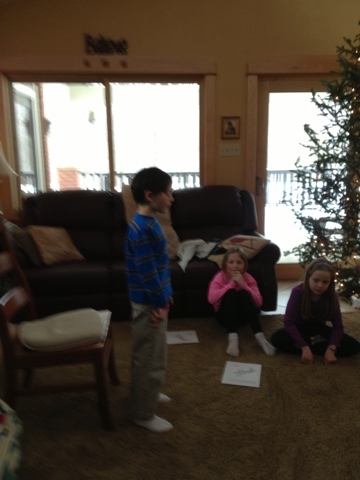 This program was easy to integrate into Margaret's "school" day. I made little cards with a flower and the words "Flowering Baby" on them and put them in her workboxes. In the same box I would put any necessary materials she would need to complete the activity such as books, crayons, weather materials, etc. The Flowering Baby card would be her signal that she would need to come and get me for the activity. From there we would follow the suggestions outlined in the guide. Since I had already previewed the daily activities to get the workboxes ready, I had everything on hand and knew what parts of the day we were going to complete. Some of the things an average day included were a book, a song, some writing, outside exploration/ discussion and some activity pertaining to the current theme we were studying. 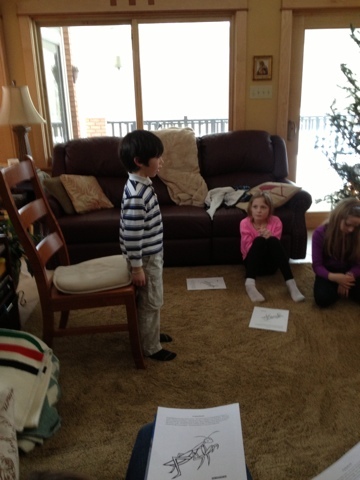 Being veteran homeschoolers, we of course tweaked the program to meet our needs. This was also very easy and didn't take away from the meaningfulness of the program. Usually it was just something simple like an activity I knew Margie wouldn't like (ie: dressing in blue. She is going through a purple and green phase. Blue was a couple months ago). Creating her picture using all different shades of blue. Weather of the day. I don't know where she lives, but it hasn't been that warm in a while! Learning about shapes. Look how impressed Malcolm is with that triangle! Making triangles out of pattern blocks. I like when the flower is in my workboxes because it is always something fun. Except when it is about bears. Bears will bite off your legs. Flowering Baby, LLC is available in several different workbooks to fit your needs. 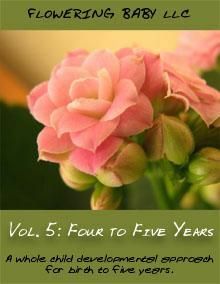 You can purchase the entire five year curriculum, Birth to age 5, for $132.00. Each age level is also available to be purchased on it's own for $30.00 to 38.00. These workbooks include the suggestions for daily activities. All supplemental materials (crayons, clay, picture books, etc.) must be provided by you. 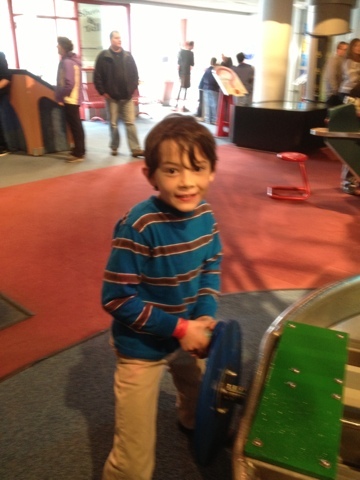 Many other families used Flowering Baby, LLC and voiced their views over at the Schoolhouse Review Crew Blog. Click here to read those reviews, or click the banner below. Disclaimer: As a member of The Schoolhouse Review Crew, I received the products listed above free of charge in exchange for an honest review on this blog. I was not required to write a postive review. All views are my own or those of my family and I received no other compensation. I am disclosing this in accordance with the FTC regulations.